Wanda has always been a “sensitive” and sensed energy and energy forms since childhood. She has explored many aspects of the spirit realm through spontaneous experiences such as out of body travel, premonitions, dejevu, and clairvoyant visions since childhood. Wanda tried ignoring this aspect of her life during early adulthood to fit in with the crowd. She was not encouraged to use her abilities. But, soon after starting her own young family, these abilities spontaneously reawakened and she has been on an exploration of spirit ever since. With these experiences increasing in 1992, she was compelled to seek training to focus, understand, and control the energies; as well as to understand the alien/entity encounters, spontaneous healing and other entity encounters she has experienced. Wanda continues her exploration to understand the invisible world to validate the experience of others hoping to dispel fear and share a deeper understanding of the spirit world. Wanda uses her psychic sensitivity and mediumship abilities (Psi Factor) to detect spirits, and when needed will use equipment, and research protocol to detect Paranormal Anomalous Phenomenon. Eli has always been a sensitive and creative individual. Eli has remarkable recurring dreams of galaxy’s and planets where he is shown constellations and mineral compositions of these planets. He is very adept in using Dowsing Rods to locate hidden objects, lost objects and energy fields. Eli is aware of past life memories and experiences strong spells of Dejavu’. Eli is a very unique individual because he was raised in a home that accepted his dreams and sensitive nature. He has always had access to a library of information on Ghosts, Spirits, UFO’s, Psychic Development, Spirituality, and Energy Healing Method’s to name a few of these categories. He has also had the opportunity to accompany his Ghost Hunters of Guelph, on investigations and was introduced to meditation and divination techniques at an early age. 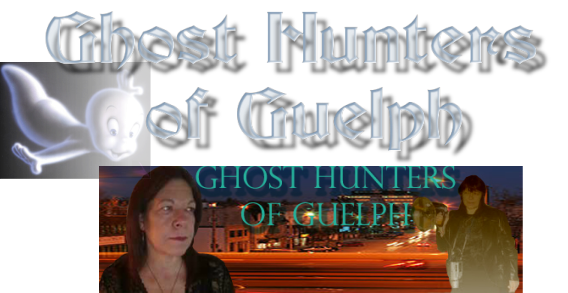 Eli is a member on the board of directors for Ghost Hunters of Guelph. Quantum physics, and the understanding of Universal Energies, fuel his imagination and ability for thinking outside the box. Since childhood, I’ve always thought I was being taught and shown. I saw my Grandfathers spirit when I was about 12 years old. It was pure energy at its finest! But, when you mention it to people, they say there is no such thing as ghosts. With fear taking over at night, I would tell myself there is no such thing, don’t be scared. Then life went on hearing the odd weird unexplainable noises of glass breaking, things falling over, but; yet no evidence to explain these things. Then one day I met my beautiful wife Lori who was fascinated by the paranormal. Immediately I became the skeptic trying to disprove everything. Taking pictures in cemeteries, old houses, anywhere we could go, we did. Getting nothing at first, then a couple of years later, a few orbs started appearing, making me more intrigued on the inside, but, yet still skeptical on the outside. Until 13 years later. We went to a cemetery on a warm May evening. My wife was taking pictures and I was drinking my Tim’s. Just then an orb appeared and floated in front of me! I was fascinated, not thinking of anything, just watching it in amazement. Then it darted off in the direction of my wife. As she turned her head towards me it flew into the side of her face. She screamed and grabbed her face. It took off and disappeared leaving us shocked with what we witnessed. Now, I believe there is more to life than we know. Then one year later we contacted Wanda. We have been investigating together for the last couple of years and now we are complete to let history write itself once again. When I was a little girl, Ghost Stories were "My Thing". When I went to all the birthday sleep-over’s I was the one who knew all the scary Ghost Stories to intrigue and scare all my friends! As I got a little older, ghost books became my new enjoyment, hearing all the stories about spirits, good and bad began to drive me into the paranormal and I read more and more. Then, one day, I met my husband who was kind, sweet and caring. He made fun about the paranormal world but I knew one day we would have proof that would change his mind. We went to a lot of places, cemeteries, abandoned houses and never got much proof. Then we started getting orbs in pictures of all different colours, so that made it more interesting for myself and my husband to keep moving forward in search of the paranormal. Several years later, 13 to be exact, we went to a cemetery. It was warm, quiet and peaceful, the perfect night. I had the camera and he had his coffee. We were standing about 5 feet away from each other. I was taking pictures and I turned to look at my husband. Just then, it felt like someone grabbed my face really fast, so I turned my face away and let out a little scream and saw this white thing take off and disappear with a blink of an eye. I looked at my husband and he looked like he was in shock of excitement and he kept saying. “Holy Crap!” “That was an Orb!” We stayed for a couple of minutes, and then we left. It was something we talked about for about a year, knowing, this is what we were looking for; a glimpse of the unknown. We decided to call Wanda at the Guelph Ghost Hunters and well, here we are, doing what we were all meant to do. I had become interested in investigating the paranormal after strange occurrences became more prevalent in my 38 yr old house. The incident that would eventually start me down my current path was at first ignored, a set of three random numbers written in dust on a television screen. At the time I thought nothing of it but upon further evaluation no one had made the marks and no children or guests were in that area of the house for approximately 3 weeks. Not long after that initial incident, I would hear my wife saying my name as if she was behind me, but I shrugged it off to imagination. Sounds of books falling or paper tearing were also heard by my wife when she was by herself. We now can hear the noises at the same time; always the identical sounds though sometimes in different locations. We've grown so accustomed to the occurrences that we don't even bother to get up and investigate them anymore. These events and others in our home led us into the field of paranormal investigations. In the above pic. Gerald is using dowsing rods to determine the location of a murder (which could be) causing a haunting. Dowsing rods have also been known to find unmarked graves and can answer simple yes & no questions. Guelph Ghost Research at Specterweb. "All houses in which men have lived and died are haunted houses: through the open doors, the harmless phantoms on their errands glide, with feet that make no sound upon the floors.... By Henry Wordsworth Longfellow (1807-1882)"